Your Resume Can Survive a Lost Job! There’s a reason that businesses hire employees for a “probation period.” It usually takes a few months for new workers to learn the ropes and start adding value. Employers use this time to determine whether you’re worth the long-term investment. If the manager likes your performance after the first 90 days or so, consider yourself gainfully employed. If your performance wasn’t up to par, you know what happens next: you’ll lose the job. But let’s turn the tables for a moment. Getting fired is not always a bad thing. Losing a job can lead to new opportunities. It can shake up a stagnant career. It can even remind you that you aren’t following your dreams, and provide motivation to get back on track. If you were dismissed due to poor performance, you probably stayed too long. During the probationary period, you surely noticed that something wasn’t right. The hours, the paycheck, the culture. Or the job responsibilities didn’t match your expectations. Here’s the thing. 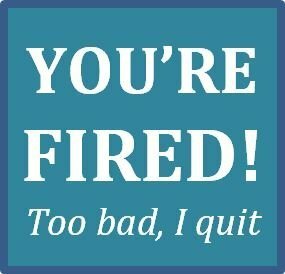 Sometimes you need to quit your job in order to save your career. I can’t tell you how many times I’ve heard job seekers say they stayed in bad jobs to protect their résumés! Employers don’t like “job hopping,” they told me, so they sacrificed job satisfaction for what they hoped was a better-looking work history. They didn’t realize that short-term positions aren’t the end of the world, and there are ways to navigate this issue in résumés that actually strengthen your candidacy. Here’s something else. If you find yourself feeling more concerned about your résumé than your happiness, your priorities are out of order. Of course, every situation is different, so weigh the pros and cons carefully. And if you choose to quit, do it with professionalism. Think of it like this: job interviews open new doors, and exit interviews make sure the old doors don’t close too tightly. If done right, your leave-taking will sustain relationships, foster respect, and support your career progression. Now, let’s fix that choppy resume. Remember that your résumé is designed to land interviews. So it’s important to create a powerful brand and streamline the document. Include only the most impressive and pertinent details about your career. Cut everything else out. This may mean combining several short-term roles, removing irrelevant jobs, or showcasing the transferrable skills from fast-turnaround positions. Let’s say your background includes 10 years in non-profit administration but recently you tried a short stint in sales that didn’t work out. Before moving forward in your job hunt, determine if the sales role strengthens or weakens your résumé presentation. Are you targeting sales opportunities? Switching to the corporate sector? Keep it in! But if you wish to return to your former career, make your non-profit expertise jump off the page instead. Life doesn’t always unfold as we expect. If you need to leave a job to protect your health, happiness, or well-being, by all means. Leave. You can revise your résumé once you’re out the door.